White Magic Info- rituals & spells, oracles, meditation. Learn magic! White Magic springs from the idea, that everything in the universe is permeated by an intelligent, transcendental Power. White Magic is the ability of humans to influence the flow of this Power. The magical view of the world comes from the knowledge, that everything on all levels of the Reality is interconnected in a huge, multilayered network of energy. What our mind perceives as many isolated objects, are in reality not isolated, but connected. A change in one object influences and changes another objects. Therefore, it is possible to influence a certain point of the net, by the accumulation and direction of the energy flow into another point of the net. This flow can be created and consciously directed through the Magical Work. Magic can be learned, and world can be influenced. We should keep always in mind, that Magic influences not only world around us, but it also influences us. (Because the first and the strongest impulse for magic is created inside of the Mage.) Therefore, we should not just try to blindly fulfil all the desires we feel inside of us! First of all, we should forever strive to increase our personal wisdom and inner morality, so that we are able to create only things, which support us and not something that will go against us. Do you have a question concerning magic? Or do you need a help? 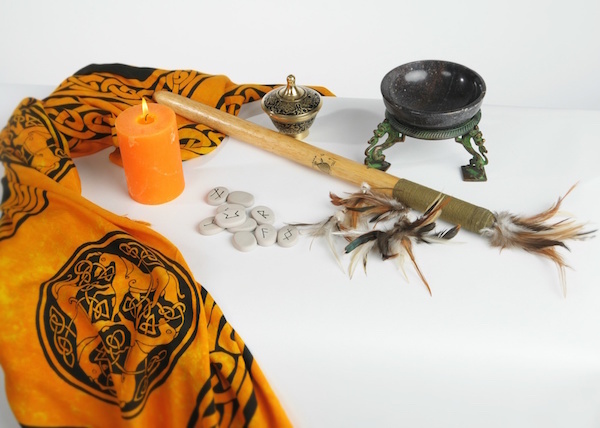 White Magic Ritual serves as an efficient instrument, which moves the magical powers towards a desired direction. In order to connect with the Supernatural (with spirits, Gods, all pervading Love, Voodoo Deities…), one should concentrate properly and use the accurate amount of energy. Ritual consists of particular prayers, dealings, sacrifices and cleansing ceremonies, which are in analogy with the desired result. 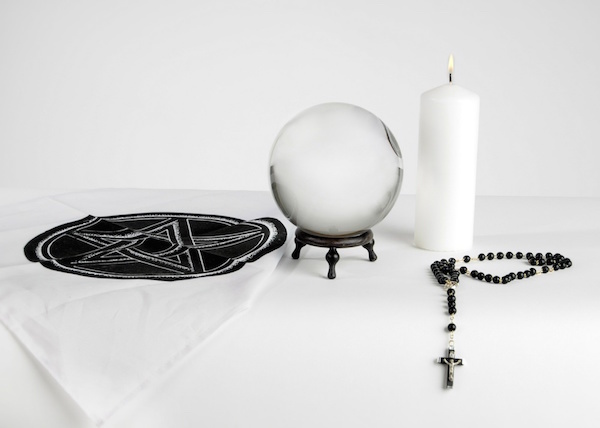 White Magic Ritual: in order to perform a successful ritual and find the appropriate supporting instruments for the ritual, a Mage uses Oracle and Analogies. The right decision is not just based on logical thinking – because often only partial information is available and the important things are hidden. White Mage always seeks the counsel of Gods, spirits and Unconscious. For example, the Oracle can be Tarot, I-Ging, Runes or Voodoo Obi Oracle. In order to receive valuable information, one has to ask proper questions. The principle of Analogy says: „As above, so below; as within, so without; as spirit, so body“. That’s why during the waxing moon phase, a Mage does rituals focused on growth, magnification (of love, money, good luck..). And during the waning moon phase, the Mage does rituals focused on reduction, disappearing ( of disease, Bad Luck...). When we go further, Planetary Magic tells us that every day and every hour is assigned to specific planet. Helps separate from people, habits and is good for endurance: to accomplish targets to the end. Power, self-confidence, vitality, money, health. Intuition, family, relationships, changes, spirituality. Gives power to overcome obstacles, also accidents, it helps in making fast decisions. Communication and the power to convince, perfect to help with exams. For welfare through so-called lucky chances, for acute lack of money and justice. Love magic, harmony, enjoyment, romantic passion, delight, art and beauty. If you work on yourself, one day you will certainly gain, what you're looking for. Or, maybe, you won't. Maybe you will gain something much greater than that! White Magic is not a profession but a mission. It is a way to spread faith, truth and love. White Magic is the communication with the dormant powers within us. Arnold Schwarzenegger is very good example of the things mentioned above. When he was 16, he already knew that he was going to win Mr. Olympia, and then go on to act in movies, and that afterwards he would help people as a politician. He had a completely clear vision, and he continually worked on the fulfillment of his aims. He once said: "I had very big aims. I would hate myself, if I had to tell myself that I failed to fulfill them." Maybe you have similar talents and brightness. You should just go inside of you to find out, why you are here, what you want, and how you can reach it. And then you should spend every day, every minute of your life in achieving your destiny. Continual learning is another important quality of great personalities. Arnold Schwarzenegger or Bruce Lee if you want, steadily learned from the people who were in their professions and were better than them. Later on they realized that it is also worthwhile to learn from people with lower capabilities than oneself. This topic is described very well in Shunryu Suzuki´s book - Zen Mind, Beginner's Mind. White Magic goes even deeper and deals with the things like: karma, chakras and deities. On the spiritual level, karma is a principle of action and reaction. The law of action and reaction says that every action (power) immediately produces an equivalent reaction (anti-power), which goes back to the producer of the action. This law is valid not only in physics, but also in general. What we give, will be given back to us at a different time. Mages have to be able to find out, why certain things are happening ‘from the karmic point of view’ in somebody's life. For example, somebody may be born with a certain handicap because he/she had caused the same handicap to somebody else in a previous lifetime. Chakras are "centers of power" or vortexes of energy in a subtle body. In a physical body they interact with the body's ductless endocrine glands and the lymphatic system. There is always a reason, as to why somebody needs to sleep just few hours, while another person sleeps for 10 hours and is still tired. For example, Albert Einstein functioned with very little sleep. Why do we actually need sleep? White magic deals with these powers that are ‘secret’ and not recognisable at first sight. What you think today, you become tomorrow. 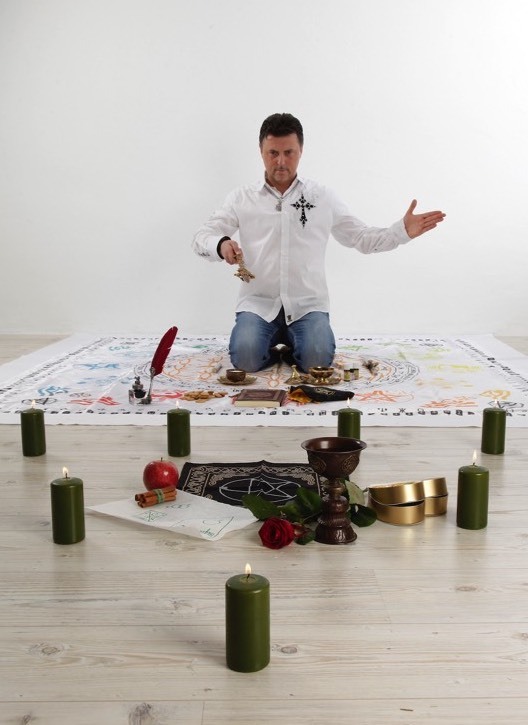 Invocation and evocation are magical processes, which connect the conscious mind and personality of a Mage with "something" or "someone" from the outside. We can call this "something" or "someone" a spirit, a deity, an entity, or also an energy form or an information with awareness. The effect is the same. This connection transforms our consciousness and brings new information, awareness or knowledge. 1. Suitable for everyone- strong concentration on deity/energy, prayer, singing songs about gods, giving presents. 2. More complex, along with previous activities, a mage performs certain magical techniques, during which, through the strong concentration, the consciousness of the mage merges with the chosen entity and they are in resonance, in harmony. The invocation is successful when a mage hears inside of him/her the voice, which is not his/hers, and s/he loses the feeling of him/herself, and the ego is merged with the deity or power. This process is very similar to possession. Thus it is useful to invite to the invocation another person, who can communicate and record the conversations with deity. This is a procedure, which calls and invites chosen powers/entities and they concentrate or manifest within a certain place. To make this happen, a mage usually uses certain tools for protection, like a magical circle, candles, mantras or prayers. The entity, or demon, comes to the certain place, which is always outside of the magical circle. By the evocation, a mage can hear some cracking sounds and then a kind of fog appears, in which the entity manifests and takes a shape. So, if someone wants to call negative entities, he should use evocation. It is not safe to invocate them, because they will possess the body of the mage and in order to gain oneself back, exorcism will be needed. Certain steps need to be performed for successful evocation. At the beginning, before the evocation, a mage has to prepare everything in advance. Then, h/she speaks with the entity, presents his/her desires or needs. The demon/entity also says, what it wants in order to fulfil the mage’s requirements. At the end of the evocation, it is necessary to thank the entity for coming, say goodbye and return the entity to the sphere, where it came from. During evocation it is necessary to make the immaterial entity visible. So, this technique is very energy demanding. Therefore, most mages prefer invocation. Evocation can be also be dangerous, so one has to carefully follow basic safety rules. Many modern mages use astral travels for communicating with entities. This means, that the mage doesn't call the entity, but s/he travels in his energy body into the certain sphere, where the entity resides. The problem of this method is, that the mage needs lots of experience, because otherwise s/he can get lost or confused. This problem comes from the fact that we are strongly influenced by our own unconsciousness. If the mage doesn't know his/her unconsciousness well, so that his/her hidden tendencies are conscious, s/he will be dealing with these hidden things from his/her own unconsciousness during astral travel. If someone is present at such an invocation, s/he can observe, that the body position, behaviour or also voice of the mage changes. One can improve his/her magical work and rituals with certain breathing techniques. Rhythmic breathing helps a mage to inhale more oxygen and to obtain more energy than usual. This way, one can achieve a light trance state and the communication with the immaterial world is easier. You should keep yourself to yourself during magical practice! An altar is a place where you practise regular meditations and prayers. It is your personal sanctuary. Having a special room for your magical work is the best. 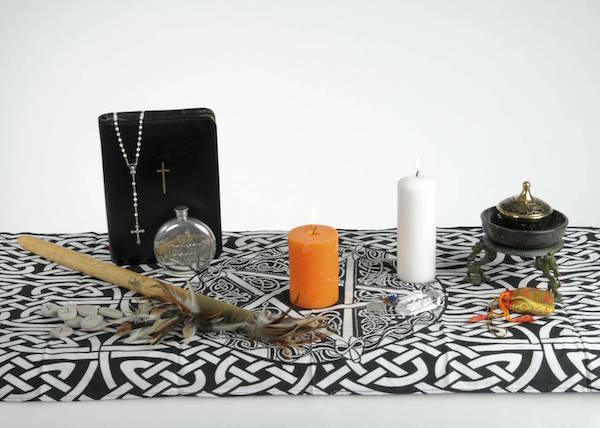 When you often exercise free rituals, the altar can be portable. Create it according to your feelings. I would recommend putting a white candle, a pentagram symbol in the middle of circle or a crucifix . The more magical rituals you execute on your altar, the more of a powerful place it will be. Therefore pay attention to aromatic substances, use pure essences, not the synthetic ones. The White Mage, who works with analogies, works with the fact that like attracts like. The reality is made up of our materialized desires. One can achieve a lot with targeted wishes, but sometimes a little bit of time is necessary. A wish is the power of thoughts. Thoughts leads to the activity. Activity leads to the reality. When a white mage changes his consciousness, the reality changes. You also practice magical rituals in your day-to-day life, but you just haven't noticed it yet. Everybody attracts the kind of reality which he/she has in his/her attention. For example, we practice negative rituals every day, like complaining about work or politics, getting angry by watching the news on TV, cursing out the red lights while we're driving. Positive examples are evening prayers or meditation before bedtime. We don't recommend an adept of magic to evoke any deities, demons or ghosts without the supervision of a master. Without supervision this can be very dangerous. When a student is ready, the master will show up. Until this happens, we recommend saying prayers and affirmations and calling on angels. To evoke deities and ghosts safely, an adept should not only read a lot, but also meditate enough. The adept has to be able to remain in thoughtless awareness and also to be able to recognize the source of his/her thoughts and wishes. There is a generally accepted opinion that, all thoughts in our heads are created personally by us. But the truth is that thoughts come to us from 5 distinctly different sources. God and his messengers (angels, gurus) and our soul. This source is absolutely positive. From this source comes love, big inspirations and also works in the form of books or beautiful artwork. Many artists and scientists draw inspiration from this source, and so do people who serve and do something positive for others. People such as Mother Teresa, Albert Einstein and Leonardo da Vinci and many, many others. One's own ego. Our false image of who we are. It is the part of us that believes that we are just this body, our feelings and our thoughts. But all these aspects draw their existence from the soul, which is immortal. Our ego is the source that often feeds us with fears and stress. One's environment. This includes all that we read, radio, TV, friends, school, work, and even advertising. This source can be good but can also be bad. It depends on what kind of friends we have, what we read, which television programmes we watch. Devil, Satan and his messengers. This source can cause unreasonable depression, panic, wrath, greed and rage. This is absolutely a negative source. Another spirits, who can be positive or negative. There are uncountable numbers of spirits so I can't mention all of them here. Our communication with them makes it clear, why they have contacted us. Just like with people, these beings can have good or bad intentions. Once an adept realizes, where the impulses he/she feels inside comes from, he/she is prepared for the true spiritual path of magic. Magic is not a game to be played one day and not played the next. Magic is a tool like atomic energy. It can give us light, which can help us; but when it is not used properly, it can also destroy. The stories about Atlantis tells us about the end of a great civilization; it was destroyed due to the wrongful experiments with magic by black mages. One truly should, and also has to learn a lot. But it is very important to acknowledge, that particular abilities or powers come from God only at the right time. The right time means that a man/woman is prepared, that he/she has a deep enough mind and a clear head. For example, St. Peter gained powers in this way:" And I tell you, you are Peter, and on this rock I will build my church, and the gates of Hades will not prevail against it. I will give you the keys of the kingdom of heaven, and whatever you bind on earth will be bound in heaven, and whatever you lose on earth will be lost in heaven." If one uses the powers in the right way, these magical powers will get more and more powerful with every lifetime. If the powers are misused, they will get weaker and weaker. A saint can learn even from obstinate person, but obstinate person is not able to learn even from a saint. Potential adepts are those people who have patience and endurance. An Adept knows, that s/he will gain magical powers and knowledge through his/her daily work. Only this way can magic bring results. Even the master cannot initiate a student without reaching a certain level of energy and knowledge. The only shortcut to having powers is to borrow them from demons, and this shortcut leads only to one place — hell. Beware! Demons will always cheat you, it is their essence. They will promise you everything and tell you what you want to hear, but they will not reveal whole truth to you. So, the only safe way is mastery through everyday work and personal sacrifices. Papa Nemo – Der Weg des Voodoo; Von den Grundlagen zur Praxis. How can I learn White Magic? What qualities are important for potential Mage? Readiness and openness, the ability to explore and examine existing postulates and ‘truths’, the ability to modify them into one own's image, or, if they don't resonate, to completely put them aside. Strong will (spiritual and also mental), the courage and ability to see the reality in a relative way, which is connected with the ability to transform it. Commitment to daily practice of spiritual exercises that improve personal abilities, personal power (spiritual and physical) and balance. The key to the magical abilities is the altered state of consciousness. Regular meditation helps us reach an absolute inner meditation condition, also called zero point or divine point. This means, that part of our attention is always focused on the inside and it enables us to quickly detect negative thinking patterns which hinder us from being happy. We are observant and can detect fear and stress, so we are able to transform them immediately to restore our inner balance. The deeper we dive, the more intense our thoughtless awareness, which enables us to experience astral trips. Our development can be measured by the extent of our period of happiness and thoughtless awareness. Even very short moments of these experiences can help us to stay in balance and inner peace during difficult times. For example the death of dear ones, disease, lack of money... this is when we are prepared for advanced levels of meditation! During phases such as this, even the position of meditation is important. When we go deeper, we lose all sensation and control over our bodies; and that’s why we should meditate in lying (supine) position or in the lotus position. In meditation, we consciously reach the dimension where we normally go to unconsciously during sleep, in our dreams! In meditation, we consciously reach the dimension, where we go normally go to unconsciously during deep sleep! In meditation, we consciously reach the dimension where dwell the dead and we stay alive and can come back! How can we reach these levels? Through accumulation subtle energies and will-power!!! Concerning this topic, we recommend to read the book: Elisabeth Haich: Sexual Energy and Yoga! Magic-consciousness degree is the amplification of magical trance. The Methods of creating magic- consciousness degree can be divided into two categories. The damping-method, which tries to calm down the spirit so much, that what finally remains, is only the goal of concentration and nothing else. The thrill-method, which tries to bring the spirit into experiencing as big of a thrill as possible during the magical goal concentration. Both strong damping and strong thrill ultimately have the same effect: the consciousness focused into one point, and this is called the magic-consciousness degree. Everyone act in the way s/he considers the best according to his/her knowledge about him/herself. Everything in this world has its consciousness and everything is interlocked one with the another. White Magic is the art of influencing reality by the power of will; the world around us is then just a mirror of our consciousness. From the magical point of view, the world is based on the knowledge that everything, at all levels of reality, is inseparably interconnected in an immensely huge and multilevel net of energy. That is why it works at one point when the energy is collected and sent from another point of this net. Real white magic is about the understanding and steering of our desires. 1.) Mastering one's thoughts and emotions. 2.) Ability to stay in thoughtless awareness. 3.) Ability to achieve trance. 4.) Consciously moving in to the level of dreams of normal people. 5.) Consciously moving in to the level of deep sleep of normal people and bringing back some information. 6.) Consciously moving in to the level where reside the dead people and bringing back some information or knowledge. In reaching the higher levels of initiation, there is also a degree of higher ability to communicate with beings from other worlds. It is not about having a diploma, that says ‘I am a priest of voodoo’. It is about having the above mentioned higher abilities and mastering the ability to invoke and evoke different entities. Every ability that is achieved is then the next step in the initiation into a priest or a lama… But if someone doesn't work on him/herself, having a ceremony or diploma is just an empty gesture, which is for nothing…Is he able to astral travel or not? Is he strong or not? Does the financial loss or death of a close person bring him down, or is he able to calmly go through the situation and try to find a solution?? The length of the process doesn't depend on the master, it depends on the student and how is s/he following the master's instructions. This process can take several months, or many years. If the student is ready to do the exercises and follow instructions, everything goes faster. How is s/he dealing with the information from the master? Is s/he reading recommended books? Besides following the master's instructions, the process is also very much influenced by the ability of the student:to keep his/her energy high, to increase his/her sensitivity, in order to communicate with different entities. . Is the student sensitive enough to communicate with the immaterial world? Or does s/he feel nothing? What message did she or she get from the rune or tarot card, s/he was meditating with? Nothing? Then, the student is not ready. Of course, everyone has his/her own weaknesses, which need to be worked on. But even the massive energy transfer from the master cannot help the student in achieving things, because it is not a substitute for the work of the student on his/her own energy level and sensitivity. Tasks and tests are focused on the student's problematic areas. It is very individual. If for example, a student has a financial problem, his tasks will be in the area of money. Another student works on her sensitivity, a third can work on his stability and balance and the fourth is mastering his/her energy level. Everyone has something, that has to be improved and mastered. It is not better or worse, it is different. This is similar to a sport. If someone wants to be a perfect gymnast, he has to work at the same time on his power and flexibility. Even if these two things seem to work against each other. The same principle applies to Magic. One has to increase his/her energy and sensitivity and at the same time, increase one’s theoretical knowledge and practice. Example: Someone asks you a question: „How long does it take to run a marathon under three hours?“ The speed of the training depends on two aspects A.) genetic predisposition (in magic, we can call this student's karma - the sum of good deeds and efforts done in previous lifetimes) and B.) commitment- the intensity of training, proper nutrition, adequacy of training, adequate time for regeneration, the quality of his shoes. Someone with perfect genetics and training can do that within 2- 3 years. Someone else will need a longer period of time and yet someone else won't achieve this goal at all and he will just run for fun. Every possibility is ok. The same applies in Magic!!! Does a student care about his energy? Does she work on knowing herself? Does he read the spiritual books? How good is their karma? Did he achieve some level of initiation in his previous lifetimes? Does he remember any his previous lives? Or does he just perform evocations without proper training and then, end up possessed or depressed? Another factor is motivation. In the above example of the marathon, someone can have perfect genetic predisposition, but if she doesn't care about running, she won't use this potential. Without proper training, she will run just for fun and her performance will be average. Likewise, in Magic, someone can have the best karma and all the qualities to be a Mage, but if she doesn't want it and she wants to live normal life, have a family, and so on, then she will have that life. No one will force her to do otherwise. Training in Magic has to be always connected with a spiritual training, otherwise it won't have desired effect. In some cases, the magical training can be speeded up. An example of this is Lobsang Rampa. His training was accelerated, because he had certain prerequisites, which allowed this to happen. It was clear, that he was able to do it. It would have no meaning to give this type of training to someone else, because others don’t have the kind of karma and the qualities as he did. For example, if a strong magician at a high level of initiation dies, he can be a strong magician again in his next life at the age of 10 perhaps, with all his abilities and powers. This soul won't need any master to teach him or to approve him, any initiation. The initiation as a ceremony only has the minor importance. The most important are real abilities: can a student perform astral travel? Is s/he able to stay in thoughtless awareness? Does s/he maintain a high level of energy? Are they able to invoke and evoke entities? If all the answers are ‘yes’, then, one can have a ceremony or a celebration, where this student is initiated as a voodoo priest, lama etc. The name for these abilities, the title is not important. The ceremony is just a visible result of something, that already is. Because the real Magician possess certain abilities, energy and knowledge. Only these things make him a real Magician, nothing else. The ceremony can also be performed in a way, that during a ritual, a certain Deity is invoked and the adept communicates in front of others with this Deity and gives others a message from this Deity. In this way, the ceremony can also be useful for others, as they will receive a message and they will be blessed with energy and knowledge. Tests are usually not formal and the student doesn't know, that s/he is being tested. The Higher Power or Master knows, what problem a certain student has, and will give him/her a test, which focuses on this problem. Some tests can also be formal if the Master wants to show something, to hold a mirror to his student. But these tests don't have the same effect or consequences as the informal probations. If we know, that we are being tested, it is not a real test, it just shows a student, where his/her weaknesses are. The tests are individual and depend solely on the situation of the student in question. The example of a formal test can be to lock a student in a coffin with a snake. This test can show the master, how a student with a fear of darkness and snakes has developed his ability to stay calm and overcome his/her fears. For magical training, it is important to meet in person. Some things cannot be done over distance, so, a master needs to meet with his/her student at least once a year. For a student's improvement, it is important to stay in contact (phone or Skype) and to work on the tasks given by his/her Master. Many magicians and different cultures and traditions use drugs as a means to enter the astral plane (for example cocaine, mushrooms, cannabis or hashish…). Some masters use these drugs in order to help students to enter the astral plane. On the other hand, these students had to be ready to enter, so that they could understand things and receive energies. We don't recommend this method, because drugs harm the energy centres/ chakras and people with harmed energy centres cannot perform magic. Drugs cannot help students to understand things on the astral plane properly, in fact, they can prevent him from understanding messages and are useless, because the student, who is not able to enter the astral plane with his own power, is not able to influence things there, get information he needs and move to the places of his interest. Instead of drugs, we recommend breathing exercises and meditations. There is always a way into the Light! Ask and it will be given to you; seek and you will find; knock and the door will be opened to you. For everyone who asks receives; he who seeks finds; and to him who knocks, the door will be opened." The White Magic master speaks with higher spiritual masters, deities and angels in order to lead the world and the people to the higher balance, knowledge and self-awareness. Nomine Patris et Filii et Spiritus Sancti. Amen. Om, Namaste Buschido. Nome Ten Buschido Tischami. When you wish for something, and your wish is fulfilled, the fulfillment will change you. So, be careful what you wish for, because it could come true! The White Magic principle was described in great detail by the Ancient Greeks- via the Delphi Oracle. White Magic and spirituality are ways of self- enlightenment, self- recognition and wisdom. White Magic and spirituality are ways to get equability, health and joy. White Magic asks the one who would like to deal with himself/herself truly and sincerely, the hardest labor — to continuously work on himself/herself. White Magic is a spiritual path, the path to the self-fulfillment and enlightenment. 1. Continuous seeking and visiting of spiritual people, Masters and also holy and powerful places (for example Lourdes, but one should also try to find some powerful places somewhere nearby, it could be in the countryside or it could be a place where a saint lived). 2. Continuous reading of spiritual literature and holy books. 3. Unceasing practice of spiritual exercises- meditation and prayers. Regular cleansing with the help of salt water bath, mother earth and holy water, and also cleansing the house and premises with the smoke of sage, incense or myrtle. only what is good for all. Let us serve you, lord of love, all our life. as well as when we use the Powers of White Magic. there is no I, you, him or her. There is only God, there is only I am.